There are many different types of space-saving stairs and staircases you can use to save space and/or use space efficiently. The most often sought after are stairs with storage underneath. We feature examples of those below, but there are many other options when it comes to incorporating space-saving stairs in your home. Check them out below. Be sure to see our popular types of staircases and our full staircase photo gallery. There are many clever ways to add storage under stairs. We showcase a nice variety of options and ideas. Here’s the classic under stairs storage solution – a set of large storage drawers. The look great and can store a ton of stuff. Storage under stairs that includes drawers and cupboards. Well designed for maximum storage capacity and the natural wood facing looks good. Subtle built-in under stair storage drawers in white with stainless steel hardware. Example of a fabulous shoe storage under the stairs. Tiered shoe shelves in a pull-out drawer. I love this design where the stairs seamless offer both steps and display shelves. Simple built-in shelf under the stairs for display. Fireword storage compartment under stairway. Attractive stacked firewood storage accent wall under stairs with TV mounted. Functional firewood storage on exterior staircase. Firewood storage cubby and gas insert fireplace under stairway. Book storage as in bookshelves always look amazing. It’s a great way to not only add storage capacity but to create an attractive space. Who doesn’t love a kitchen pantry? We love ours. While ours isn’t under the stairs, we can’t imagine not having it. If you need a pantry or want to efficiently use your space, under the stairs can be a viable location. Built-in shelving can look great. Check out this example. Storing clothes under the stairs isn’t my first choice, but I can see it as a viable storage location for the clothes not in season. You can’t go wrong slamming a small office under the stairs. I’m not sure I like the doors that close it off. Tiny office workspace under steep staircase. Small diy desk with computer located directly under floating staircase. Handsome office with built-in desk and shelving under l-shaped staircase. Industrial style steel and wood loft staircase with office underneath. Gorgeous wood desk built into wall and concrete stairs under floating quarter-turn concrete stairs. Loft kitchen under winding staircase. While I’m not big on kitchens under stairs, this actually works really well. The stairs wind off to the side so you still have plenty of clearance in the working space. It looks fabulous too. Why not put your kitchen under the stairs? I’m not sure I’d want to cook in there because I’d knock myself out, but in a crunch, ti works. If you can swing it, placing a powder room under the stairs is a great idea. It’s a bit tight, but it’s an efficient way to add a bathroom to your home… and more bathrooms is usually a good thing. Staircase as bridge floating above bathroom entrance. While the bathroom is not directly built under the stairs, this is stil efficient as the stairs is totally open underneath offering space and access to the bathroom. You can never have enough storage space and if you have a large staircase like this, why not create a full blown storage room below it? What a fabulous little reading nook under the stairs. I love that arched design and the chair. It’s a super smart use below the stairs. Sofa under open staircase rising up in living room. Okay, someone will eventially slam their head into those stairs, but it looks cool and does save space. Space-saving staircase built over door entryway foyer. Conceptually this is super smart. Aesthetically, I don’t like it. It looks blocky. I don’t know for sure, but you could have a closet built into the enclose portion under the stairs. I’d prefer a floating design to open the space up more. Space-saving spiral staircase in kitchen in loft apartment. Spiral staircases look awesome and save space, but they’re not easy to navigate. I’d only put in a spiral staircase as secondary set of stairs or if there was no other option. Floating modern stairs rising above dining room in modern open concept house. Notice how you get a fully functional staircase plus the dining area below is fully functional. This is a great use of space. Floating modern staircase rising above living room saving space. I love floating staircases because they look great, don’t compromise the ease of use of the stairs plus you get space below them to do what you like with. This is my favorite approach to space-saving stairs. Minimalist ladder-style staircase with small footprint in loft apartment. With some clever designs, you can create staircases that take up very little space such as this one and the others below. That said, you’re not going to run up and down this staircase. It’s essentially a fancy looking ladder. Folding attic ladder stairs for saving space. For attics and other higher up rooms that you don’t need easy access to, pull-down folding ladder stairs does the job nicely. My in-laws have this for their attic and not only doees it save space, but our kids love going up there. Narrow staircase inside a home. This can save space, but be sure to check the building code in your jurisdiction so that you build your staircase to code. If a home bar is your thing, building a small bar under the stairs isn’t a terrible idea. Stairs are usually built in a central area of the home so the bar will be a central features. 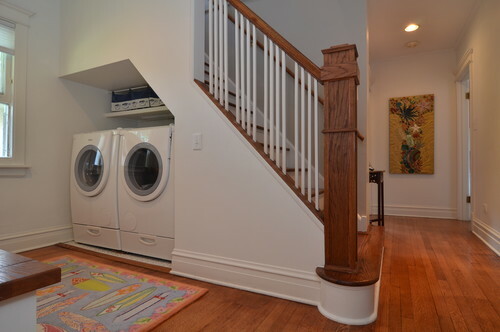 Conceptually, putting a washer and dryer under the stairs is smart. Functionally, I’m not so sure it’s the best use of the space. The problem is you don’t really have much laundry room space and in some cases you need to hunch over to do the laundry. In my view, there are better options. My favorite of all the above is incorporating floating stairs so that it’s wide open underneath for seating or nice built-in shelving.